Superman and Luthor both crash to Earth, onto a small island off the coast of Metropolis. Superman struggles up, his powers drained from the fight. Luthor also gets to his feet, his suit destroyed. Luthor tells Superman that he's going to beat him to death with his bare hands. Superman strikes back and asks why Luthor is so determined to waste his intelligence on hatred. Luthor says that he had to punish Metropolis for betraying him. Superman tells Luthor that it's not about the powers. As long as there are people like Luthor, Superman will always be there. With a final blow, Superman knocks Luthor out. He stands for a moment before falling over himself and passing out. Superman wakes to find the Coast Guard looking down at him. Luthor is on his way to Stryker's. They try to get him to lie back, but he says he's fine and flies away. As he flies over the city, the crowds cheer for their hero. Landing in their home, Lois rushes to her husband. He tells her that he'll always come back. The next day, the city returns to normal. The Kryptonian ship has shrunk back down to its original size and Clark is back at work. He receives a package from his mother containing a manual typewriter. His returning powers have been causing problems with electronics and this should solve the problem of computers crashing on him. Perry tries to yell at Clark for missing the previous day, Clark turns in a stack of stories he did while out of the office. Perry then tries to demand more dependability from Clark but Lois steps in and defends her husband. Jimmy also tells Clark that he's looking for Superman. In Hob's Bay, Superman helps to repair the damage from the attack. After repairing a building Jimmy runs up and the two fly away together. Jimmy gives Superman something he found during the battle, the Sunstone crystal. Superman thanks him and then gives something to his pal, a signal watch. Noise from across the city distracts Superman and he heads off. Downtown, Superman briefly fights Dr. Virus and Kryptococcus, the omni-germ, but the battle doesn't last long. Afterwards the crowd expresses its appreciation when Superman suddenly hears that Luthor has already broken out of jail. Story - 5: Wow. This was a fantastic week for Superman. Tuesday night I got to see the terrific Superman Returns (and actually I just got back from seeing it a second time), and the next day I read the conclusion to what is quite possibly the best Superman story of the past five years. Everything about this final issue was just great. The powerless fight was a great way to have Superman fight his arch nemesis. Lois standing up to Perry was also a great moment. And Kryptococcus! It's little stuff like this that I've really missed in Superman comics of late. Two pages of Superman saving Metropolis. It shows that he leads a busy life, while not detracting from the storyline. I'm not generally a huge fan of integrating the movie with the comics, but anything is better than that Fortress in the Amazon. 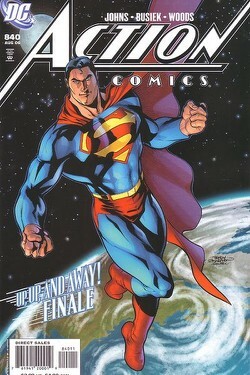 Most of this arc has been simply resetting Superman to the status quo, but that's anything but a bad thing. Some things just shouldn't change about Superman. It is a fantastic time to be a Superman fan. Art - 4: Other than the fact that my issue (and maybe yours too) had some printing errors throughout, Woods continues to impress with his work. My favorite part continues to be how he frames his panels. I don't think I'd want Woods forever, but his art on this story has been fantastic. Cover Art - 3: The only thing that disappointed me about this issue was the cover. I really love the concept of Superman floating above the Earth (and this image turned out a lot better than the movie poster), but Superman's expression doesn't work. He should look happy, triumphant, maybe even proud. Superman does not look like any of these. He does, however, look goofy, and it effectively ruins the cover. Which is really too bad, this could have been poster-worthy.